Civil aviation Colonel A.C., with Captain Carlos S. as his co-pilot, faced an unusual experience on February 14, 1967. 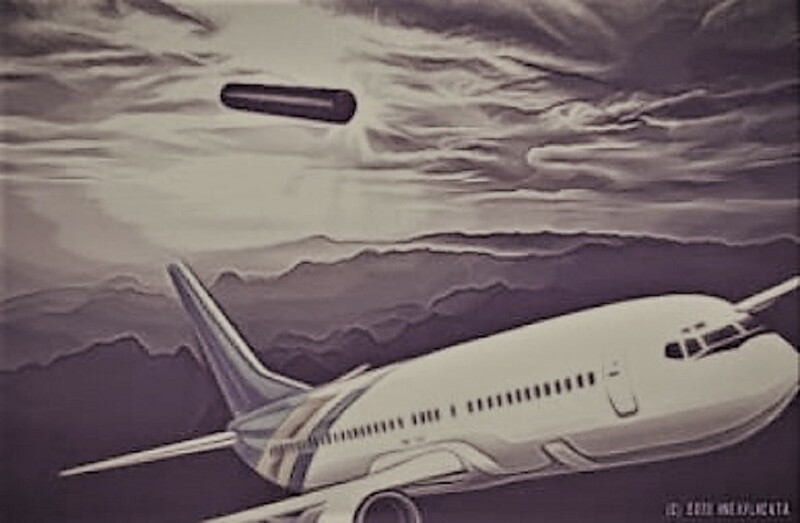 It was possibly one of the first in UFO history in which an airliner crew and its commercial vehicle faced the mid-air collision. Everything was normal that morning during the takeoff of an AVIATECA DC-4. The scheduled route was from the La Aurora International Airport in the Guatemalan capital to Benito Juarez airport in Mexico City. Conditions were relatively good, as is customary for that time of year in the tropics. The propeller-driven aircraft was halfway through its itinerary and flying over the Mexican state of Oaxaca. Suddenly, Colonel A.C. saw a black, glass-shaped object right in front of his airliner’s bow. His co-pilot became nervous, even frightened. As the fine professional aviator he was, the colonel made a sudden turn and executed “raindrop maneuver”, in his words, to make sure what was actually there. “We pilots are quite used to see things flying, even pieces of paper, at elevations of thousands of feet, but this was nothing known,” he said in an interview with Tele Sistema Mexicano, Chanel 2. Colonel A.C. only held two interviews regarding his experience. One of them for Mexican television with Lic. Pedro Ferriz and another with Guatemalan broadcaster Cesar Romero of Channel 3. His interview in Mexico, matter of fact, was nearly two hours long. NOTE: The above image is CGI. This entry was posted in ABDUCTION, best ufo photos, incredible ufo photos, MISSING TIME, top ufo news, UFO, UFO ARTICLES, ufo news, ufo photos, Uncategorized and tagged 1-14-67 PILOT AND UFO, 1967 PILOT UFO, ABDUCTION, ALIEN CRAFT, ALIEN CRAFT LANDING, ALIEN CRAFT PHOTO, ALIEN ENTITY, ALIEN IMAGE, ALIEN IMPLANTS, ALIEN PHOTO, ALIEN PICTURE, AMAZING UFO PHOTO, BEST UFO PHOTO, best ufo photos, CIRCLE LIGHTS UFO, close encounter, CLOSE ENCOUNTER UFO PHOTO, DISC, FLYING SAUCER, HIGH STRANGENESS, HUMANOID, incredible ufo photos, KEN PFEIFER UFOLOGIST, light photo, MISSING TIME, saucer, SPACESHIP UFO, top ufo news, ufo, UFO ARTICLES, UFO LANDINGS, ufo news, ufo photos, ufo photos | Tagged ABDUCTION, Uncategorized | Tagged ABDUCTION, WORLD UFO PHOTOS, world ufo photos and news | Leave a reply | Leave a reply | Leave a reply | Leave a reply by KEN PFEIFER. Bookmark the permalink.